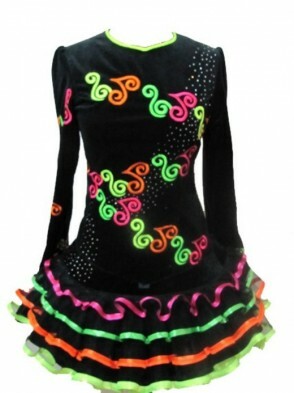 For sale is this beautiful Irish dancing dress. One piece dance costume with a low dropped waist bodice. Black velvet fabric with celtic embroidery give to this dress very nice look. please check the measurements carefully in description to ensure a best fit. The dress is brand new and its coming with pants and head top. Asking Price: £450. Shipping costs are not included in the asking price. Will accept returns and refund the cost of the dress, buyer to pay all shipping costs.